One thing that’s not discussed often enough is what to do when you make money from your artwork. The concept of directing money from items sold, also known as income in the business world, is called cash flow. The assumption, of course, is that you have an item available for sale. It could be anything from an album, a t-shirt or even a simple a $.99 download on iTunes. If you don’t, I encourage you to continue reading this post then immediately work on developing a product to sell. It is impossible to profit from your music career until you have a tangible product that your fans can pay money for. Ok, back to the lesson at hand. Chances are your parents never taught you about cash flow and it certainly wasn’t a lesson at school. I first learned about cash flow from a book called Rich Dad, Poor Dad by Robert Kiyosaki. 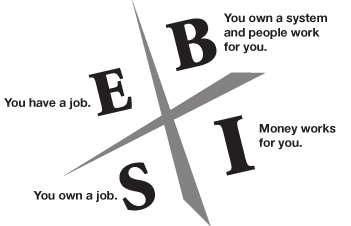 In the book, Kiyosaki teaches the difference between being an employee, self-employed, a business owner and an investor. Most people are taught to go to school or learn a trade so they can earn money. This is indicated by the E & S quadrant on the left side of the grid below. While working for money is respectable, it rarely leads to the type of freedom that could eventually allow you to record and perform your music around the globe. On the other hand, the vast majority of those who accumulate enough money to avoid reporting to work every day did so by either becoming a business owner or an investor. These people don’t trade their most valuable asset, their time, in exchange for a paycheck. Instead, they leverage their money and receive exponential returns in the same amount of time that most dedicate to their job. These people are indicated by the B & I quadrants on the right side of the grid. Now you may be thinking, “good to know, but how does this apply to my music career?” The answer is in how the two sides manage their cash flow. Once employees and the self-employed receive a paycheck they pay bills, buy commodities, and essentially pay everyone else before they pay themselves. Business owners and investors do just the opposite. As soon as they receive income they pay themselves first. Then before they pay bills or buy random items they invest in themselves, or in your case, your music career. So how do you move from the left side of the quadrant to the right side where the REAL money is? My suggestion is to treat your music career like a business and follow the 70/20/10 principle. The 70/20/10 Principle one of the many lessons taught in the Richest Man in Babylon and suggests dividing all the money you earn into three categories: Savings, Investments and living expenses. This is an excellent strategy to follow to not only finance your music career but also to get out of debt (*cough, cough student loans*) and grow your personal wealth. 1. Save 10% portion of every sale or paycheck you earn. You should do this before you spend money anywhere else. As I mentioned above, this is the key to a rich person’s fortune. 2. Invest 20% of your income into your music career. Let’s face it, creating a quality project is going to take some sort of funding and initially, these funds will have to come from your pocket. So rather than being constricted by these costs or wishing for a label to foot the bill why not allocate funds to make them happen for yourself? Once you’ve prioritized paying yourself and investing in your career, you’ll unconsciously adapt your spending. It may be tough at first but stick with it. Soon you won’t notice the difference. And of course, if you would like to ask me a specific question, leave a comment below and I’ll respond with my best advice.